Trikatu is the Sanskrit word meaning "three spices". 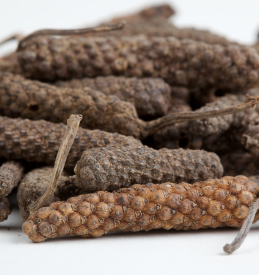 In Ayurvedic practice trikatu is used to burn ama (toxins) and excess kapha in the lungs. It also has the effect of regulating cholesterol and reducing obesity. You can feel the warmth as this hot and pungent spice mix raises your metabolism and opens your lungs. Recipe Instructions: Capsules/Powders : To use take half a teaspoon of trikatu with 1 teaspoon of honey. You can use this spiced up honey to flavor a cup of green tea if you like. Alternatively, add 2 pinches of trikatu to a cup of tomato juice. Which ever method you choose, take trikatu in the morning before eating or drinking anything else besides water. Fast for 2 more hours, then eat lightly. Ayurvedic :Ayurveda, the ancient medical system of India, is a holistic system that encompasses the healing of the body, mind and spirit through diet, lifestyle and cleansing. Cholesterol : High cholesterol is directly linked to diet and lifestyle and as such, using herbs as medicinal foods should be a first line defense and treatment. Powders :Powdering herbs is a three step process - drying, grinding and sifting.